Lovely Marillyn from “Just Making Noise” and living in Costa Rica with her family asked me to be her Sweet Wholesome Wednesday special guest and I proudly accepted, no one has ever asked me to be a guest on a blog, so I was very flattered. I really wanted to make something that would fit her cooking style, and make it wholesome. So I substituted regular milk to this recipe with almond milk, which is quite nutritious and healthy. You should check her blog, she has the most amazing recipes and composition of fruits, healthy desserts and nutritious dishes made with wholesome and natural products. Living in Costa Rica, you must find the most exotic and freshest fruits we can dream of here. She even promised me to make homemade Nutella with organic hazelnuts. How exciting is that? After being indecisive (as usual) about my dessert, and going back and forth between French or Italian, I decided to go ahead with this classic and traditional French dessert called “Oeufs à la neige” (eggs “snow-style”). 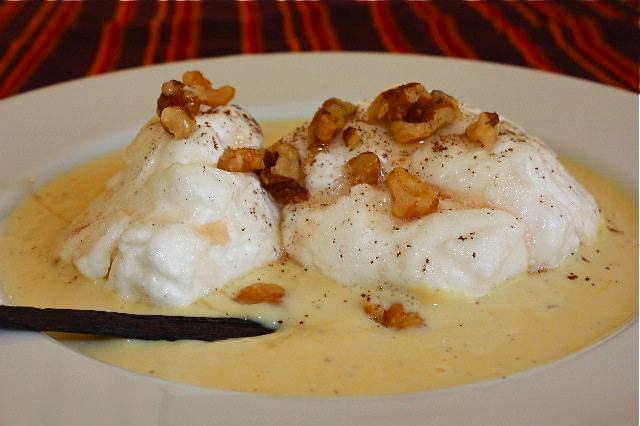 A fluffy meringue cooked in vanilla milk laying on top of a vanilla custard. Thanks Marillyn! It was great making this special dessert for you, just hope you like it! It was an honor to be your special guest. Merci encore et à bientôt ! This entry was posted by silvia on November 18, 2009 at 12:42 am, and is filed under Desserts. Follow any responses to this post through RSS 2.0.You can leave a response or trackback from your own site. The dessert looks great. I forgot how it tastes like as it has been years since I have this. Great post Silvia. I will check it out – what a great guest post you made for her! This looks beautiful. You can be a guest on our blog ANY time. Better yet, you can be a guest chef in our kitchen any time. Feel like visiting Houston??? As always, beautiful post! Ahaha thanks so much! so flattered again ) Never been to Houston but would love to, maybe one day, if I am on that side of the country, I will stop by! yummy yummy. these look beautiful! i read it – lovely post! and delicious dessert! i’ve never seen this one and must give it a try. such a great dessert!we have the same recipe,but the name is egg -flip (lait de poule),french proveniences. Ahaha thanks! yes the monkey head, I still want a piece of it! Thanks! It’s kind of fun – maybe I will have a guest on my blog too! I love this dessert ! My mother is a specialist and I always cook the “caramel” ! 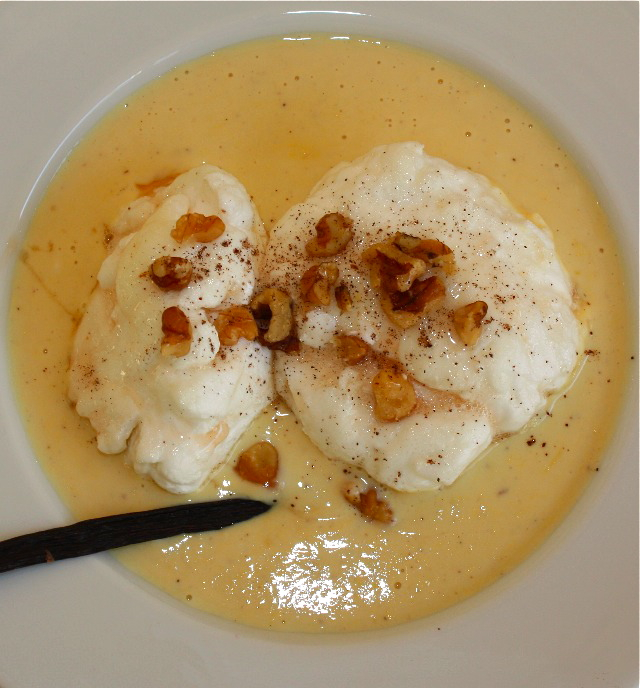 We call this in France also “Oeufs en neige” instead of “Ile Flottante” ! This looks both light and rich, all at the same time! What a treat it must be to enjoy!